With this NNTP Bridge you can follow all posts of Stack Overflow (and other Stack Exchange sites) very easily. Each question will be shown as one thread with all tags, the comments, answers and comments to this answers. Below each post, you will find the direct link to this post. So you can easily post a reply or answer the question. Also it shows your inbox and notification in a separate virtual newsgroup. Therefore it uses authentication and HTTPS (SSL). You can optionally disable this feature in the user-settings. It might help to get a better overview of all threads withing a specific tag. Also it might help if you are used to newsgroups. 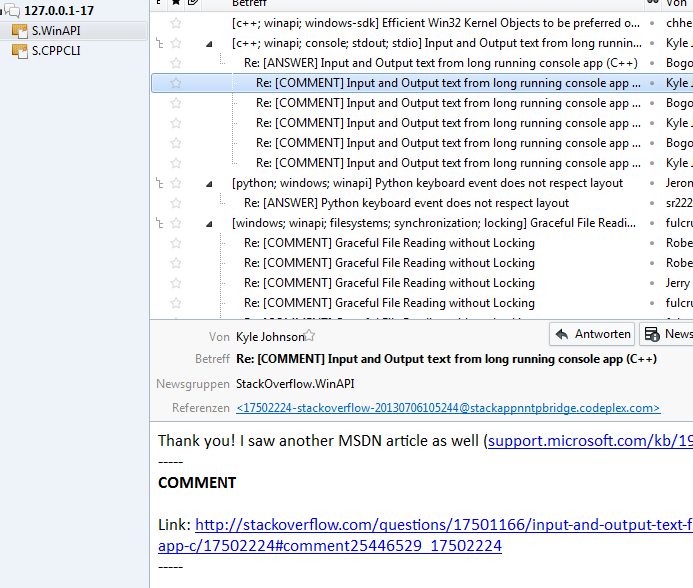 This application works as an NNTP-Server which provides the posts to any newsreader. Currently it provides only read-only access to the posts. Later it is planned to implement some write access (only commenting, because other write operations are not available in the V2.1 API). It is released under an Open Source license (Ms-PL) and the source is stored under git. The project is located on GitHub. The latest version can be found here. This application runs under Windows XP and later. It uses .NET 4 runtime and the SQL CE 3.5 runtime (for more information, see the download). The code was written in C# (.NET 4). Everyone is welcome to contribute to this project. Browse other questions tagged app posts .